I'm not sure if this is the right place to post this, but I'll give it a shot. 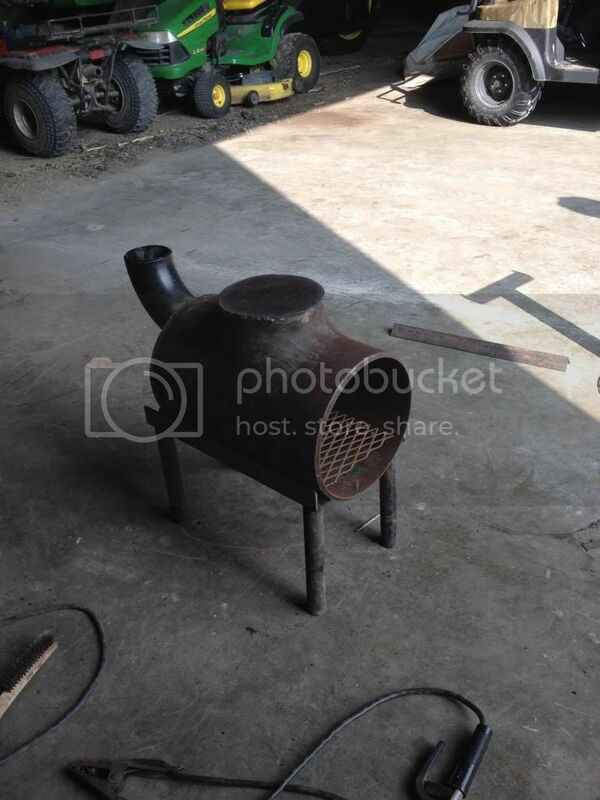 My neighbor and I recently build a wood burning stove. Most of the stuff I've looked up about camping in low temperatures is that a wood burning stove is the "way to go" when it comes to heating a wall tent. We used propane heaters last year and were almost fumed out of the tent. From what I've read, and seen, wood burning stoves seem to be more common place than I thought. Let me explain what I did and then I'll ask the question. We made it out of a 12" pipe with a "T" on the top. Not wanting the heat to escape straight out of the pipe, we welded a steel plate to the T and capped it off, essentially turning it into a "hot plate" for cooking (or whatever). 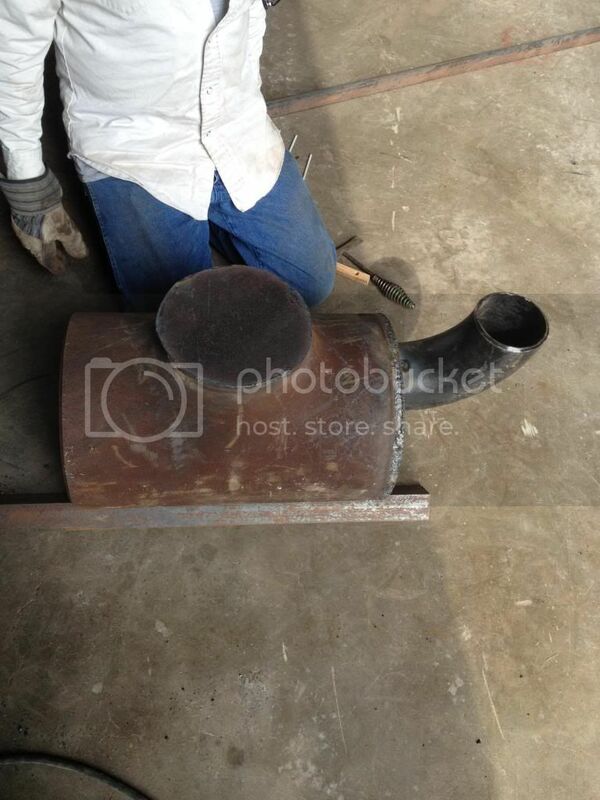 We welded and closed in one side of the pipe and cut a 4" hole and welded a 4" 90 for a smoke stack. For the door we just made a hinge, applied stove rope, made a latch, and cut open a air flow hole with a damper. We then made a stand for it that is separate so it will be easier to transport. We still have some finishing touches but for the most part it's ready to go. We actually lit it up the other day and it got really hot, but the fire seemed to want to die out with quite a bit of wood left to burn. I'm not sure if it's an issue of the air flow through the damper, or possibly because we didn't have any stove pipe attached (thus not getting a good "draw" through the stove). I'm currently debating making the air flow hole bigger, but it seems as though I've seen several people burning good fires with the damper open just a little. 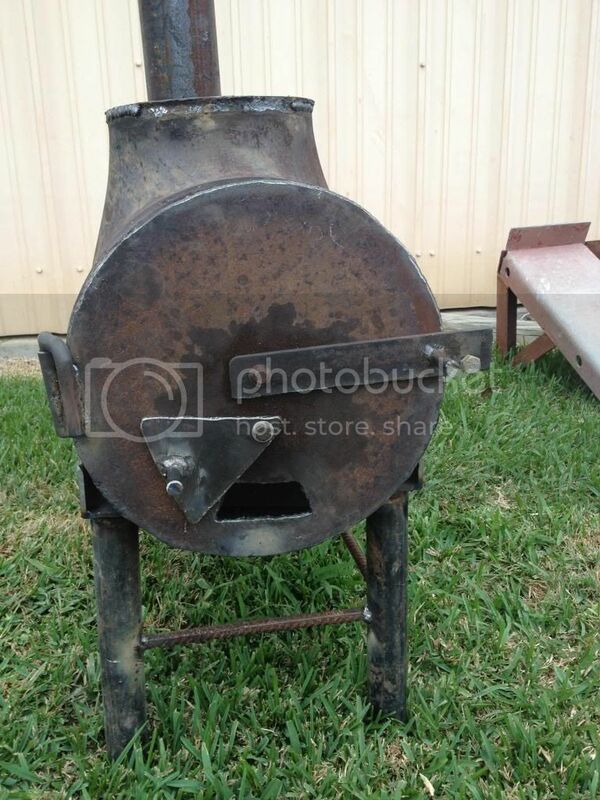 I guess my questions are: Do any of you have any good advice for building a wood burning stove? Do's and Don'ts? Any ideas on the damper and air flow situation? Any information would be greatly appreciated. I tried to attach a picture but the file is too big. I'll work on it. Not an expert here but I wouldn't go opening up the air inlet until you test the stove out with the entire chimney attached. I know 12" isn't huge but you might want to try and fit a grate in the bottom to get the wood/coals up and some air flow underneath them. ABert wrote: Not an expert here but I wouldn't go opening up the air inlet until you test the stove out with the entire chimney attached. I know 12" isn't huge but you might want to try and fit a grate in the bottom to get the wood/coals up and some air flow underneath them. Thanks for the advice. 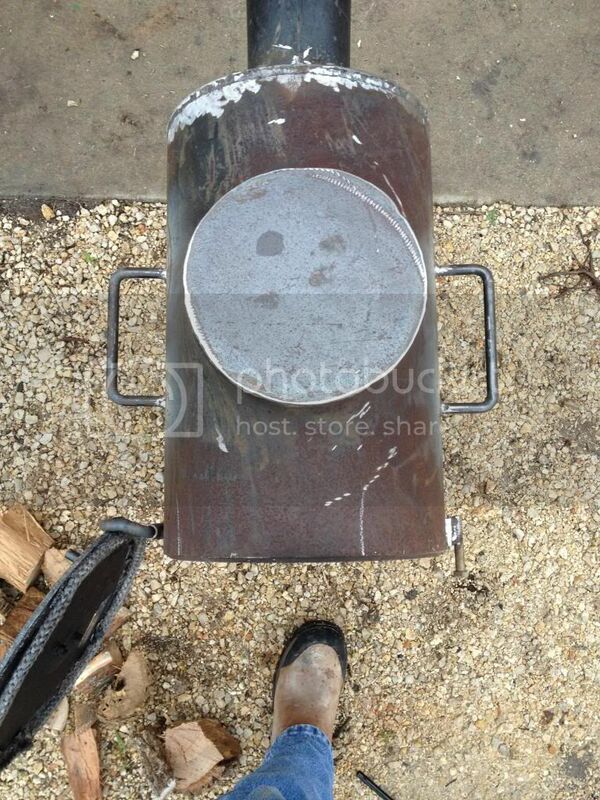 I actually purchased about 8ft of stove pipe, and a rain cap, today before I light the thing up again. Went to the local Tractor Supply Company and ran into an older man looking at woodburning stoves. He told me the air inlet is plenty big enough and that once I get it lit good I shouldn't have to open it much. He said the same thing as you, referring to the smoke stack. He said as the wind passes by the top of the pipe it will actually create a syphoning effect in the stove pipe and start to draw air through the air inlet. He said they won't burn as well if you don't have the stove pipe attached; which makes perfect sense to me. I do have some expanded metal grating in the bottom of it and am considering getting a few fire bricks to put under that, we'll see. Thanks for the post and the advice! 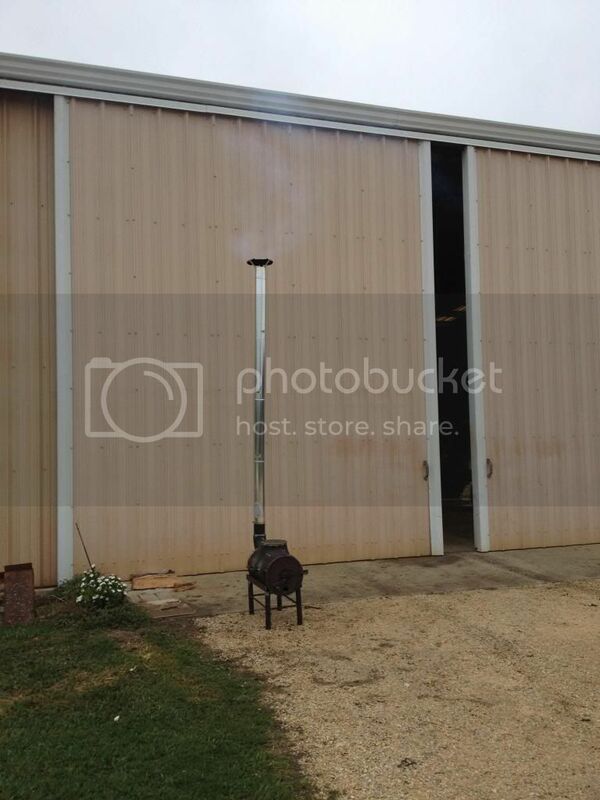 At this point we'd welded a hot plate on the top, cut a 3 1/2" hole and added a 4" 90 degree pipe for a smoke stack. Next we built a stand out of angle-iron and some 1 1/2" pipe. (later we added rebar to stabilize the legs. Took some time to make a door. We adhered a stove rope on the inside of the door, Cut a hole for an intake and made a damper, also made a door-latch that secures with a bolt. We made it "tight" enough to depress the rope as it closes. You can also see rebar we added to the stand. That looks like it will put out PLENTY of heat! Glad you got things worked out and saved $$$ over buying one. Should keep everyone in the tent nice and toasty. Just don't let the fire go out, nothing worse than getting up at 3 am to relight the fire when it is well below freezing! ABert wrote: That looks like it will put out PLENTY of heat! Glad you got things worked out and saved $$$ over buying one. Should keep everyone in the tent nice and toasty. Just don't let the fire go out, nothing worse than getting up at 3 am to relight the fire when it is well below freezing! tell me about it. I actually burned it some on the patio the night before last. It took about 5 minutes but I got a pot of water to boil on it. I probably could have gotten it hot enough to do it in a couple of minutes but we didn't want it burning long after we went inside and hit the pillow. Saving some money was definitely a plus. I'll let you guys know how well it warms a tent when I get a chance.